Craig Ogilvie says he left Harrogate Railway in the hope that a new manager can save the club from relegation. Having guided the cash-strapped Station View outfit out of the NCEL Premier Division drop zone following another season of real struggle, a run of five consecutive losses then saw Ogilvie's team plummet back to the bottom of the pile. 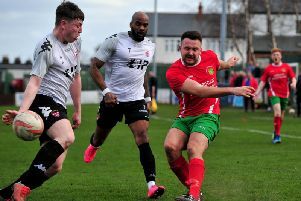 There is however still time for Railway to beat the drop, and with the club just two points from safety, the former Yorkshire Amateur coach believes that a fresh approach might yet bring salvation. "We had a bad five games to be honest and as gaffer I have to take responsibility. We’d put ourselves in a great position after the Athersley win, but it’s been poor since and in every sport the gaffer has to take the responsibility which is what I did by handing in my resignation," he said. "I wanted to give the club the option to freshen things up for the run-in as they can still stay up. They are still in with a chance of safety. "I really hope people don’t see this as me jumping ship or anything, that’s really not how I want it to come across. I just felt that my last five games were ones we should have got something from and like I say, in any form of life, management has to take responsibility. "I don’t blame the players for anything, I take full blame. I live and die by the sword and to see where the lads are now, I do feel like I’ve failed and I'll beat myself up about that. "That’s what hurts me the most as, in my opinion, we should be safe and I feel responsible that we’re not." 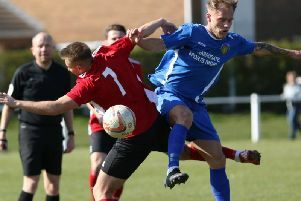 From being competitive in almost every game and picking up a number of valuable points in their fight for survival, the Rail's form suddenly tailed off after a 2-1 home win over Athersley in early March, with the club conceding five times in each of Ogilvie's last three matches at the helm. "I think the hunger had gone slightly and we did roll over too easily, but again, I’m the gaffer and I should be trying to sort that. I did try, but obviously not in the right way," Ogilvie added. "I think I kept too much faith in certain people based on form, there’s no doubt about that, and on reflection I should have looked to change things up a little. "Losing Duerds [Matty Duerden] our skipper a few weeks ago hurt us as he was the main leader we had, and when you lose that it has a massive impact." Despite his disappointment and frustration at how things have ended up, Ogilvie insists that he leaves Station View satisfied with a lot of the work he did. "Everyone said it was an impossible job and it wasn’t. Look at our results, we’ve pulled off some fantastic ones," he continued. "Some games we’ve drawn and should have won and some games we’ve lost and should have drawn. Not many have we drawn or won where we deserved to get beat. "That’s football, but there wasn't many who gave us a chance at all to do anything this year and we were four games from the end of the season and only two points from safety. "Nobody thought we’d have a chance, but the lads really stepped up in certain games and I’m thankful for their commitment over the season. "None of those lads in the changing room should take any stick for what they’ve done this year. They’ve been a credit to the club." Railway's first game since Ogilvie's departure ended in a 4-1 defeat to top-of-the-table Worksop Town on Saturday. Simon Brooker, Andy Sunley, Colin Seal and Paul Barker have taken charge of the side and will continue to oversee first-team matters until the end of the season. Tonight (Tuesday) they travel to play Thackley (15th) knowing that victory will lift them off the foot of the table.